The Joe Fresh Universal Lip Liner and Primer retails for $6CAN at Zerhs for 2.9g / 0.1 oz of product. The Duwop Reverse Lipliner retails for $19US and $26CAN at Shoppers Drug Mart for 3.8g / 0.13 oz of product. Joe Fresh Universal Lip Liner and Primer is a synthetic wax based lip pencil with no colour to it. This is a thicker wax formula meaning I can feel like on the lips and feel drier while wearing it. 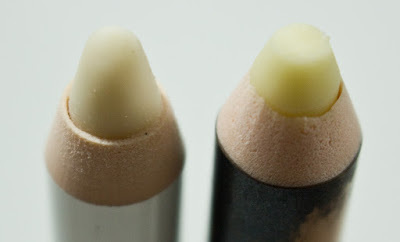 The formula does work well as a base and lip liner but you can overwork the product into your lips and cause a transparent white buildup if you're not careful. Duwop Reverse Lipliner is a more naturally derivative wax based lip pencil with no colour to it. This formula is smoother to apply and feel like more of a lip balm than anything else. The wax moves with your lips comfortable which makes it a lighter feeling lip primer. I've also tried MAC Prep + Prime Lip in the past but it really didn't do anything other than maybe lightly hydrate. But these two do prolong the wear of any lip products I've tried and decreased the amount of product that settle into my lip lines. Both also work perfectly as a reverse lipliner. Joe Fresh Universal Lip Liner and Primer I can get 16 hours wear if I don't touch my lips at all but with regular eating it wears down at 8+ hours, but with the Duwop Reverse Lipliner when I using it as a lip primer I get 10 hours. I get 16+ as a reverse lip liner for both to prevent feathering and bleeding. Both are a standard wood composite pencil that needs to be sharpened. They both work but the Duwop Reverse Lipliner has been a holy grail lip primer for years (since 2008) and still remains the best lipstick primer I've tried to this day.